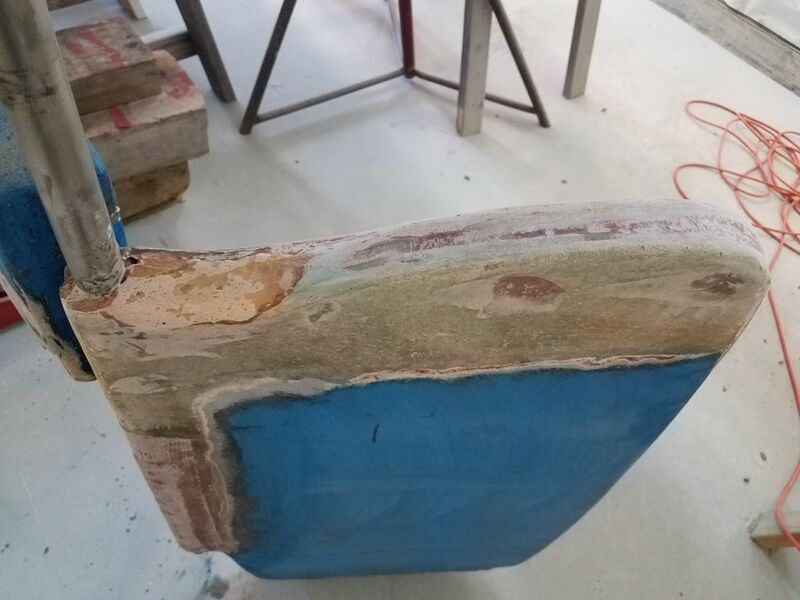 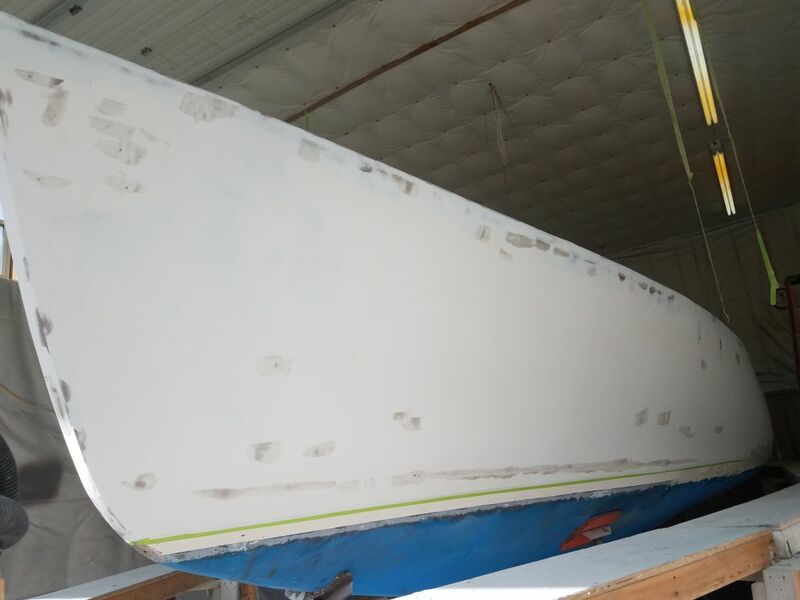 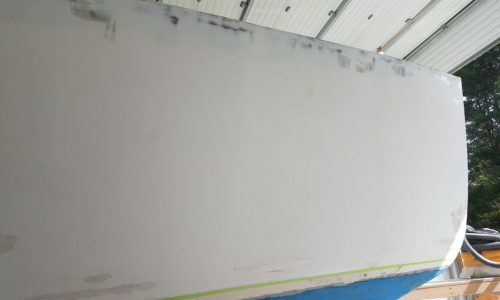 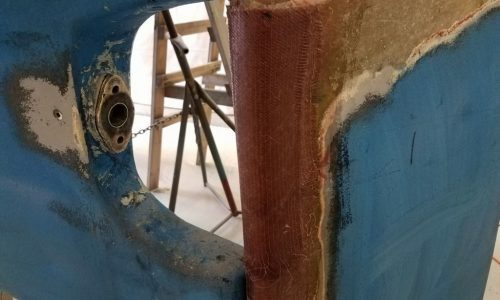 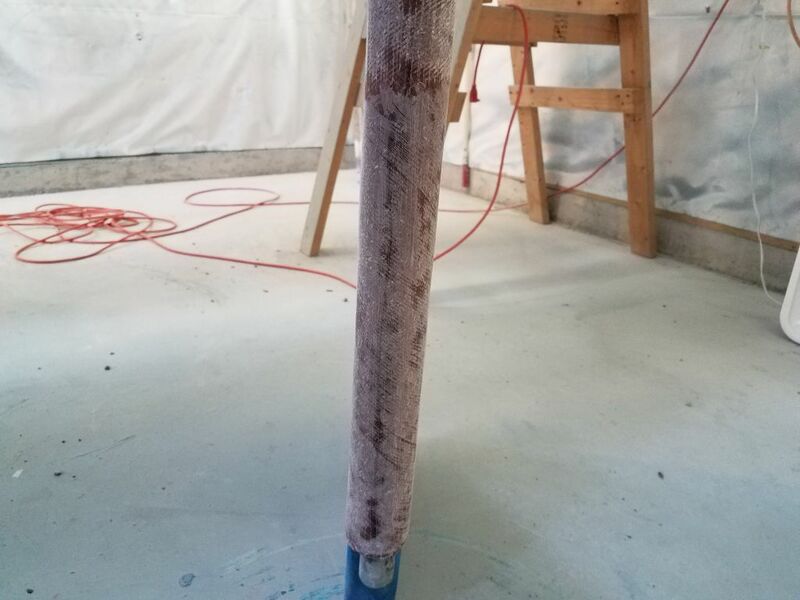 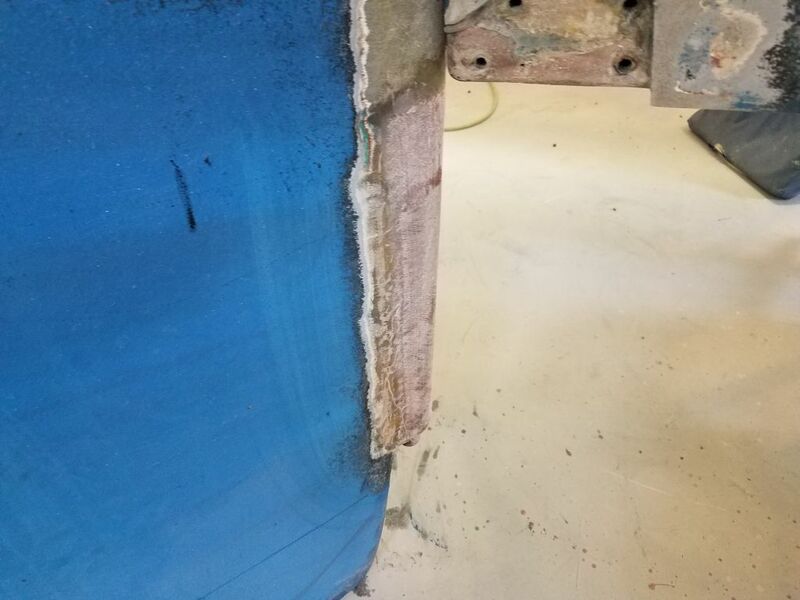 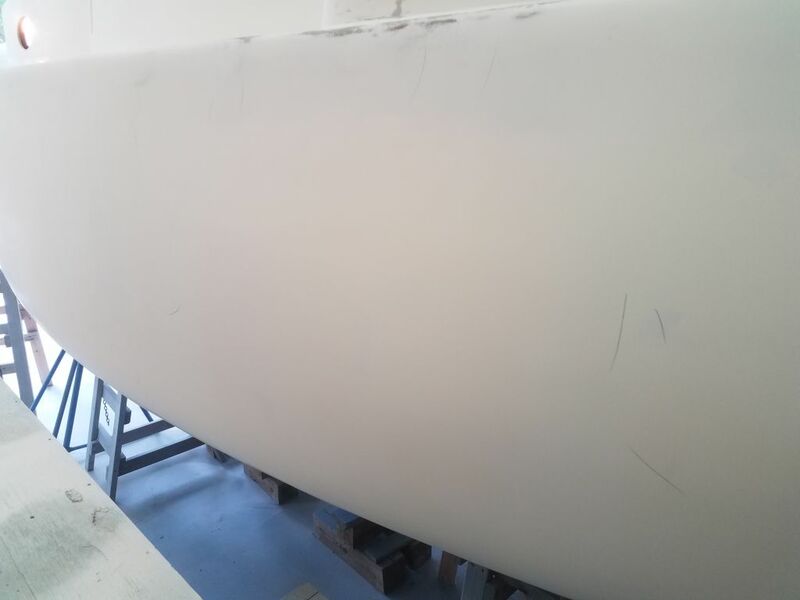 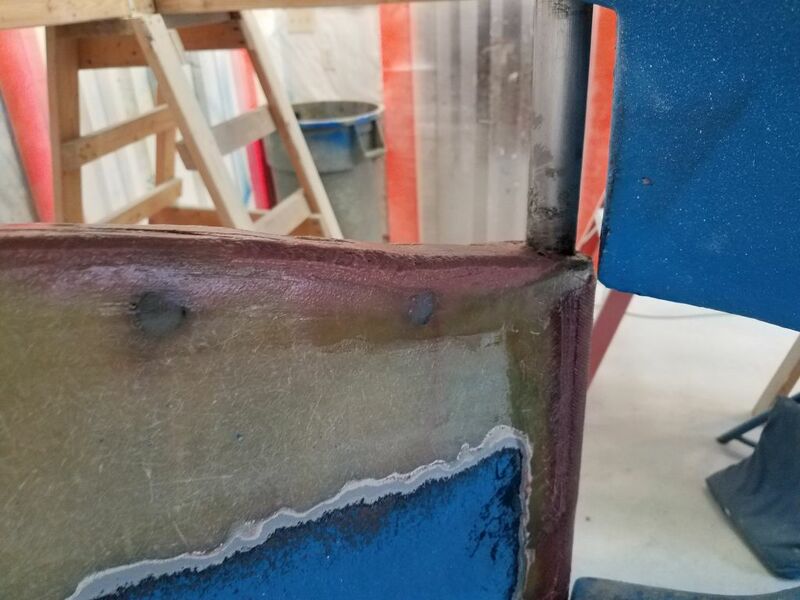 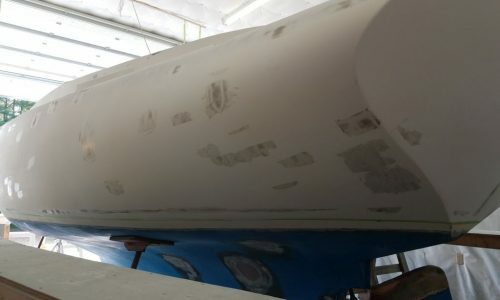 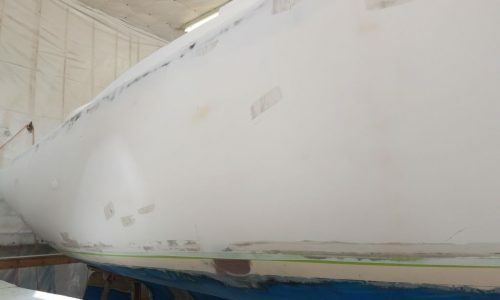 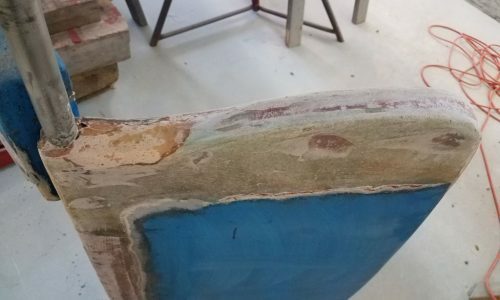 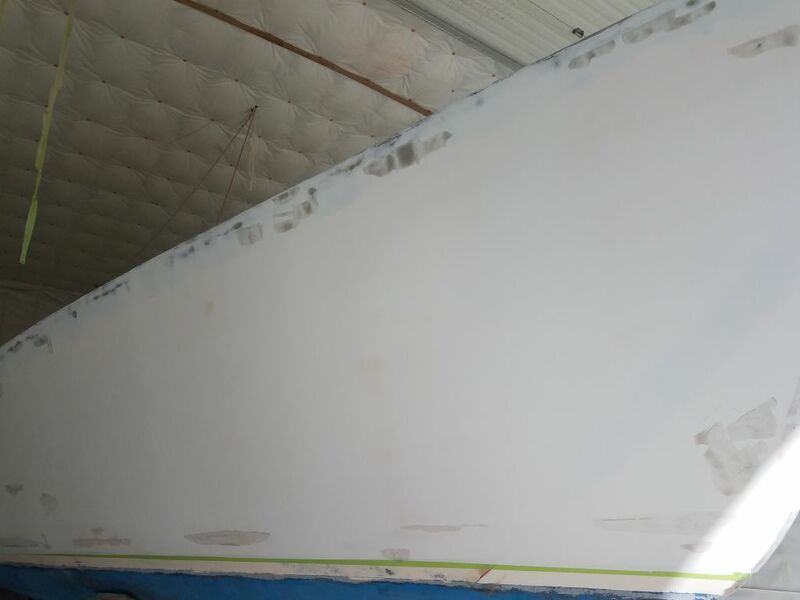 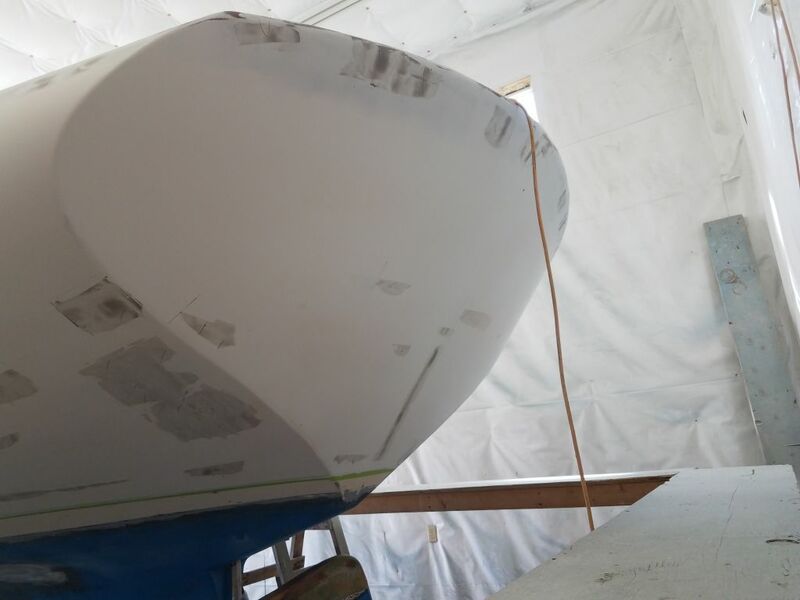 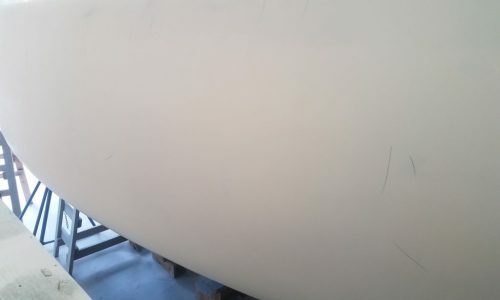 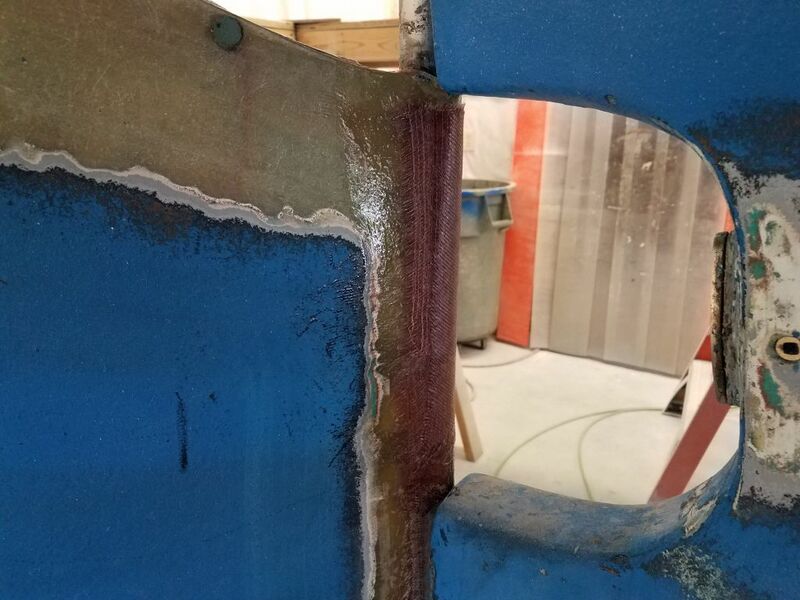 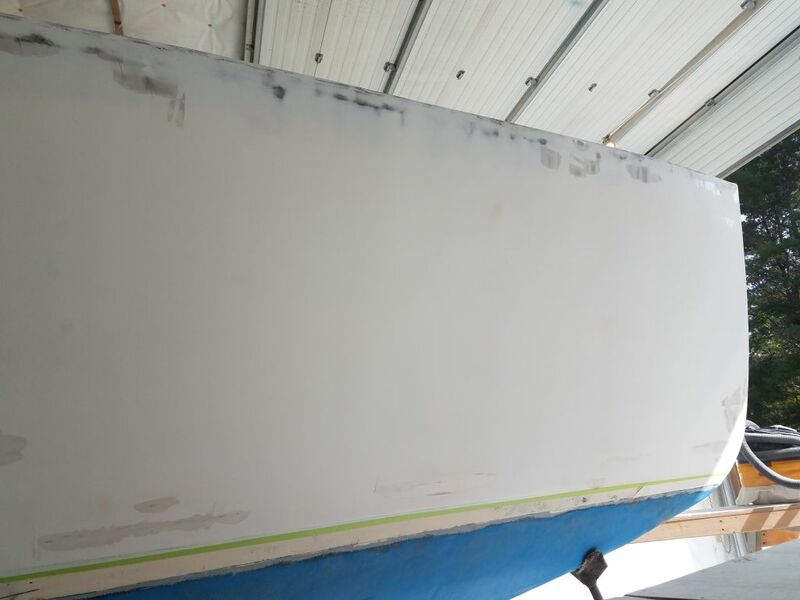 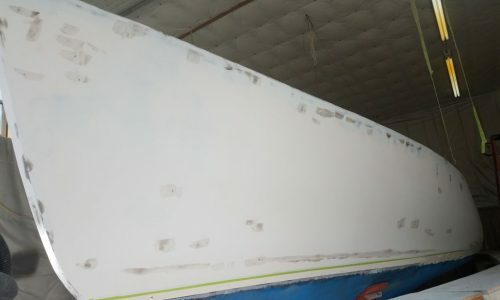 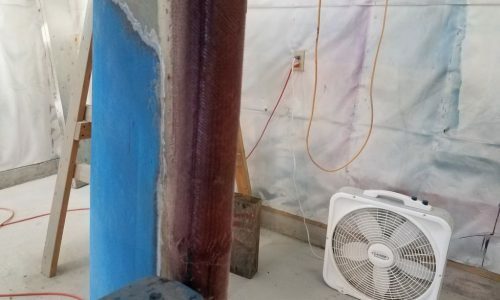 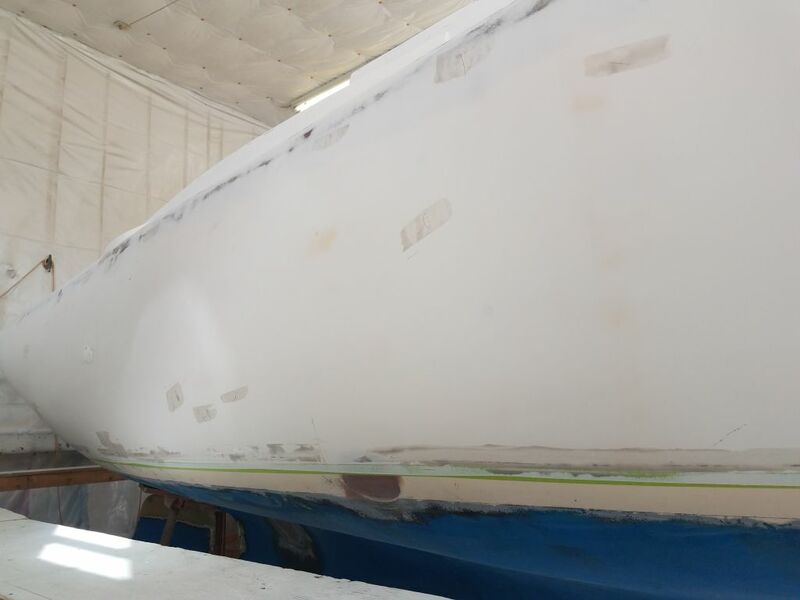 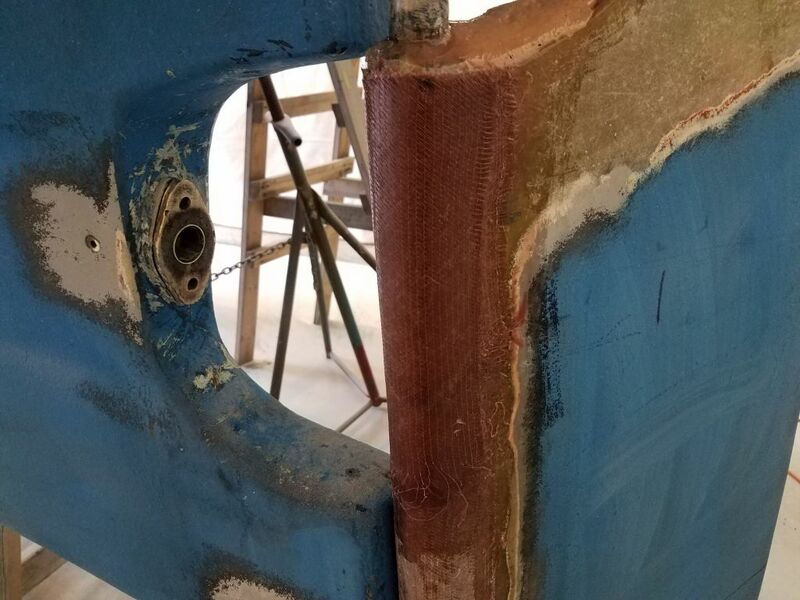 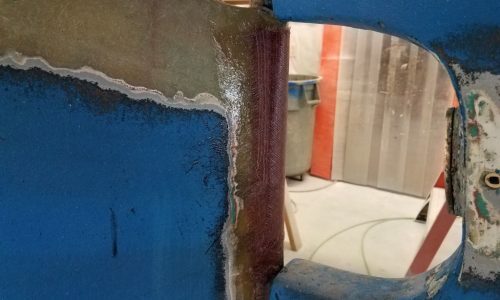 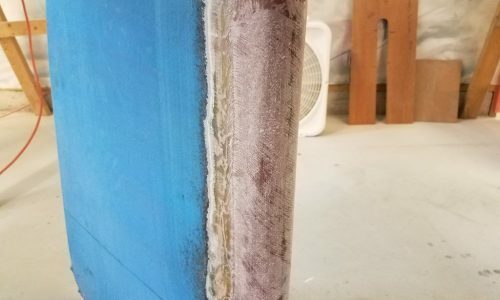 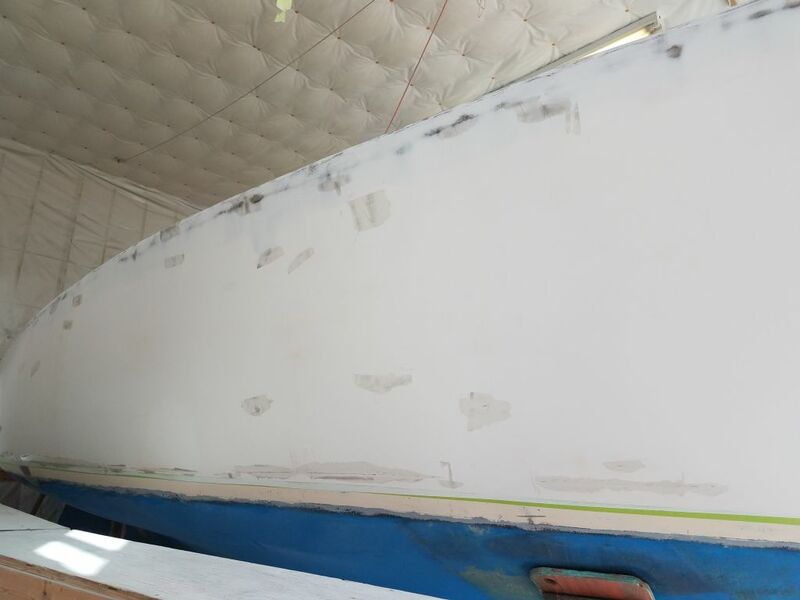 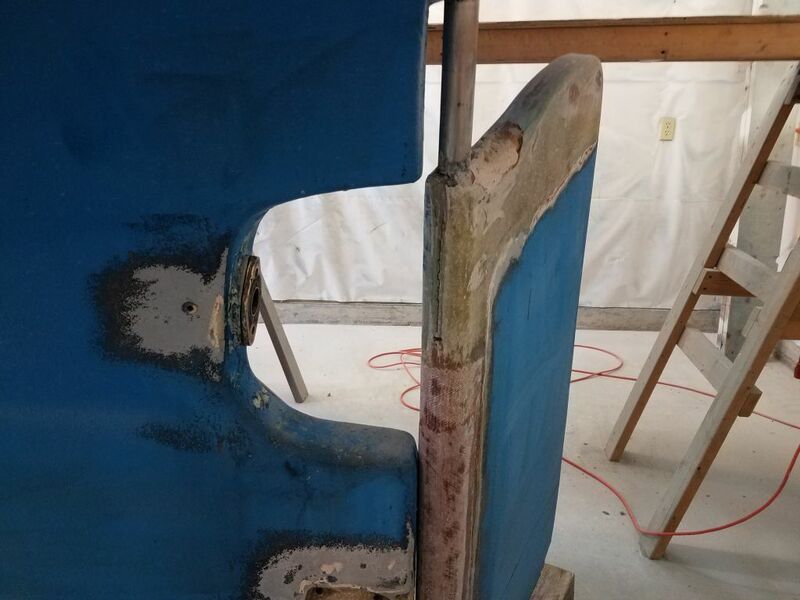 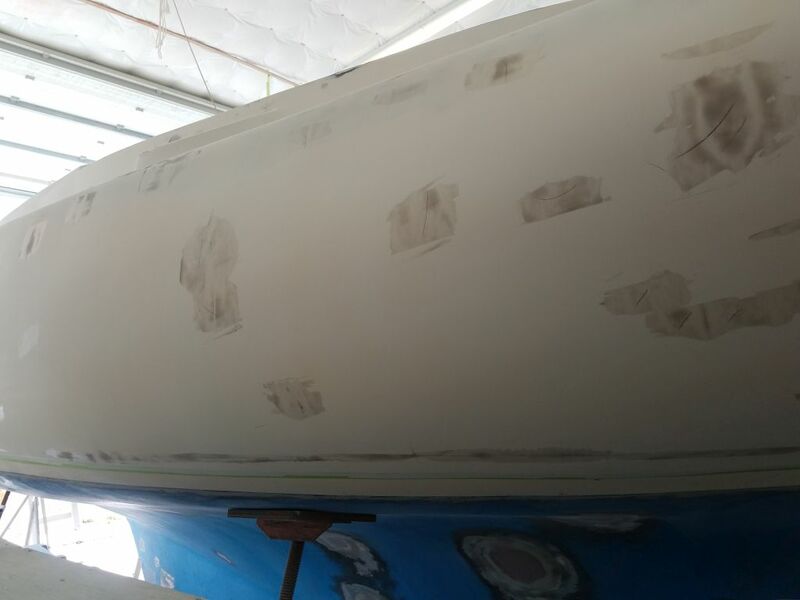 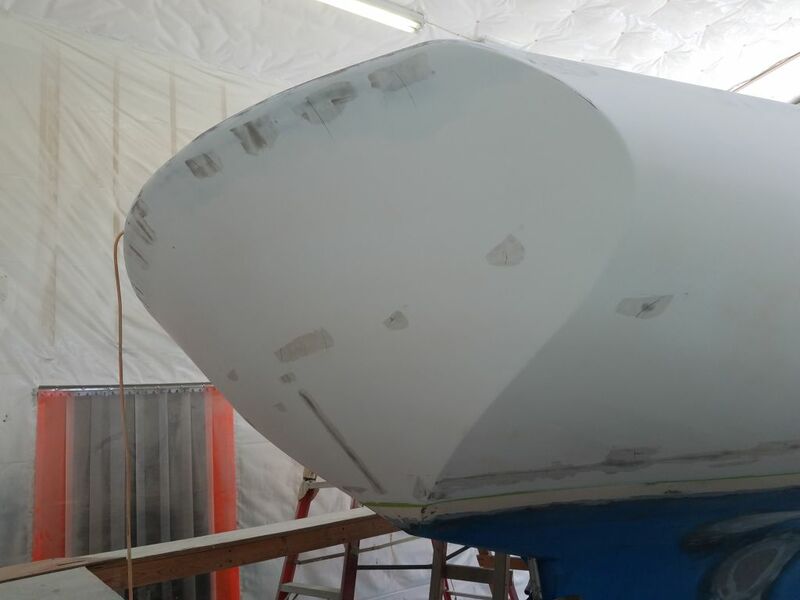 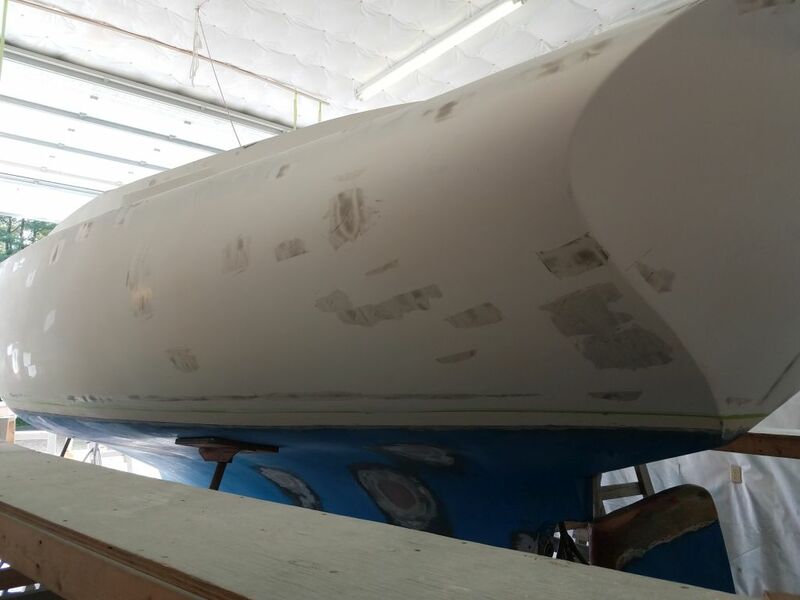 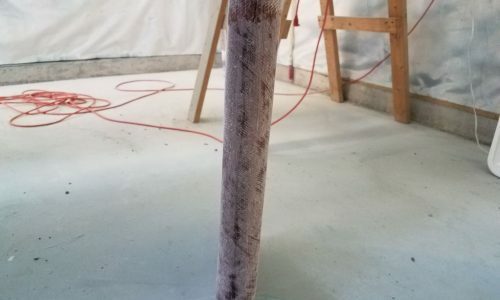 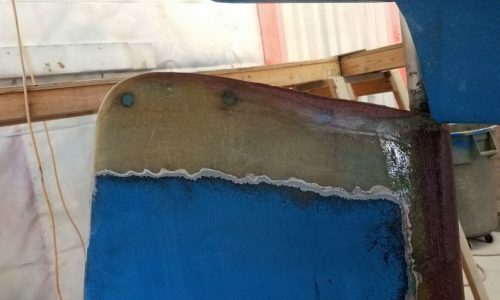 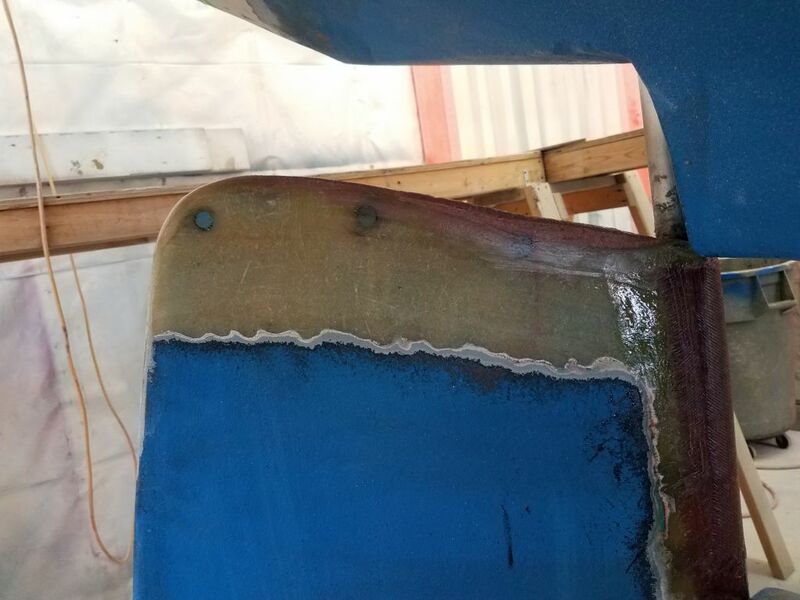 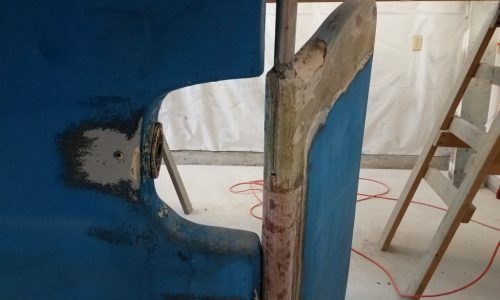 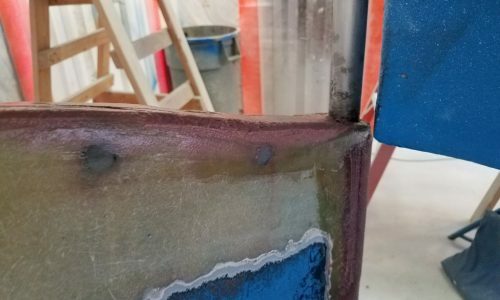 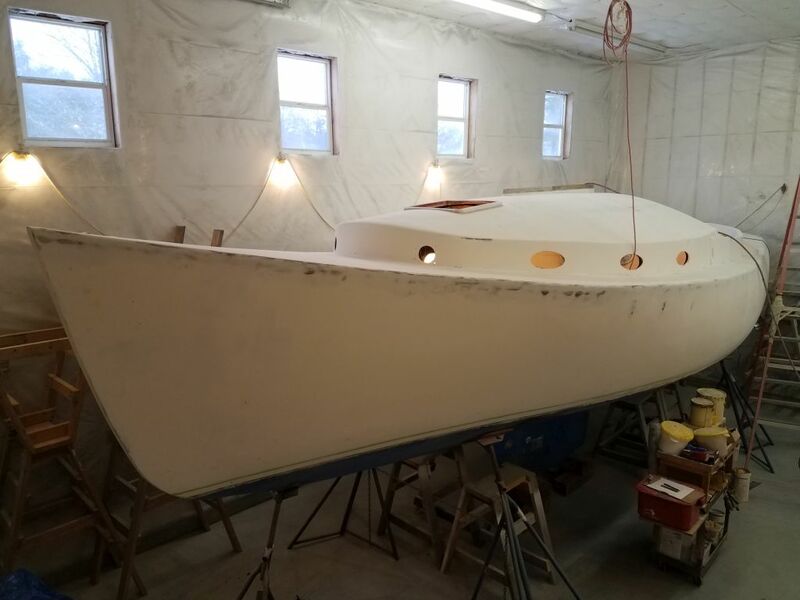 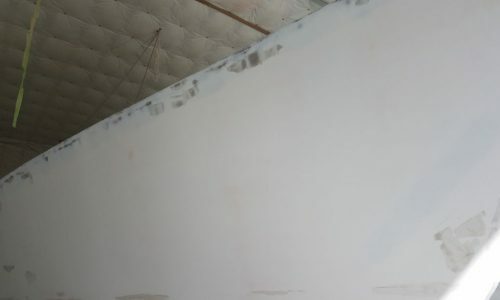 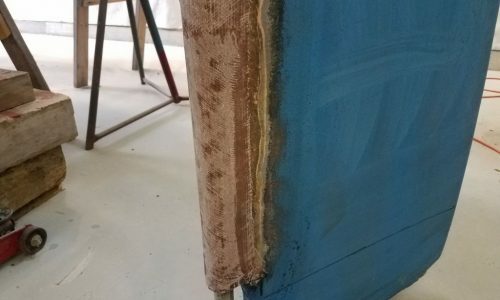 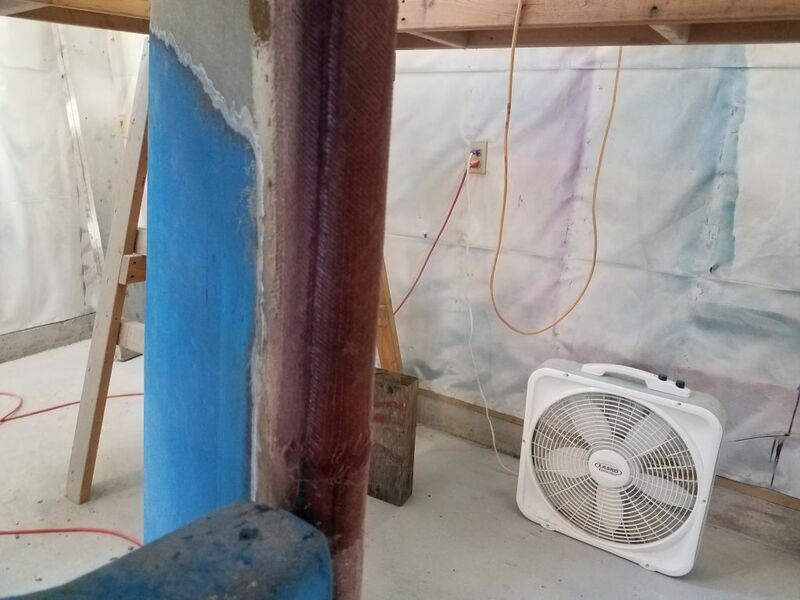 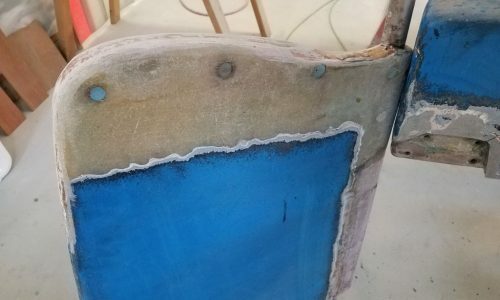 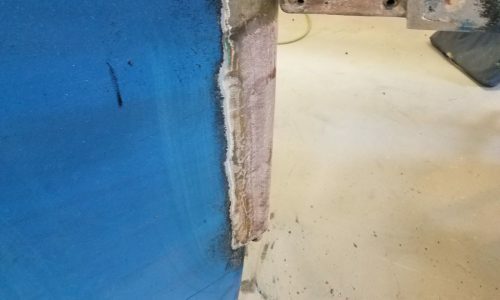 I continued work on the first stage of the rudder repair, starting with a light sanding of the new fiberglass and related work that had cured overnight. 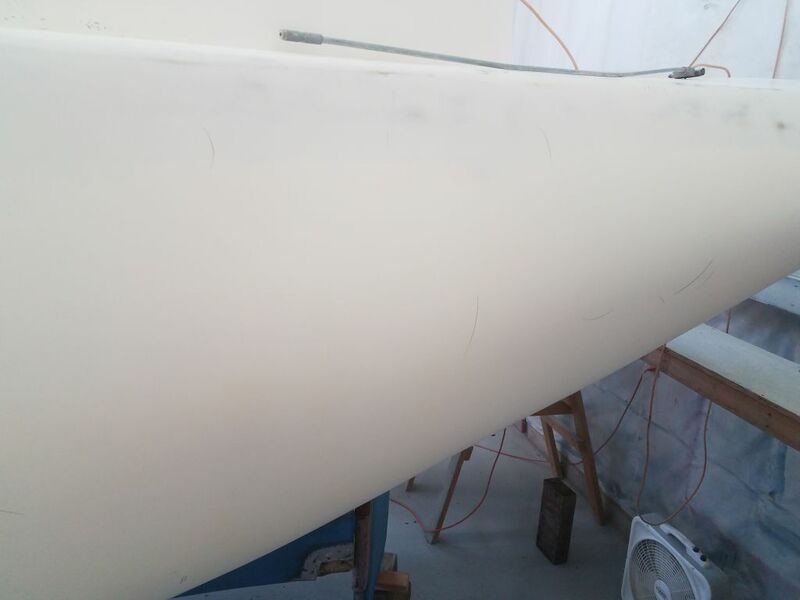 I used my plywood template to check the contours of the leading edge of the rudder over the new repair. 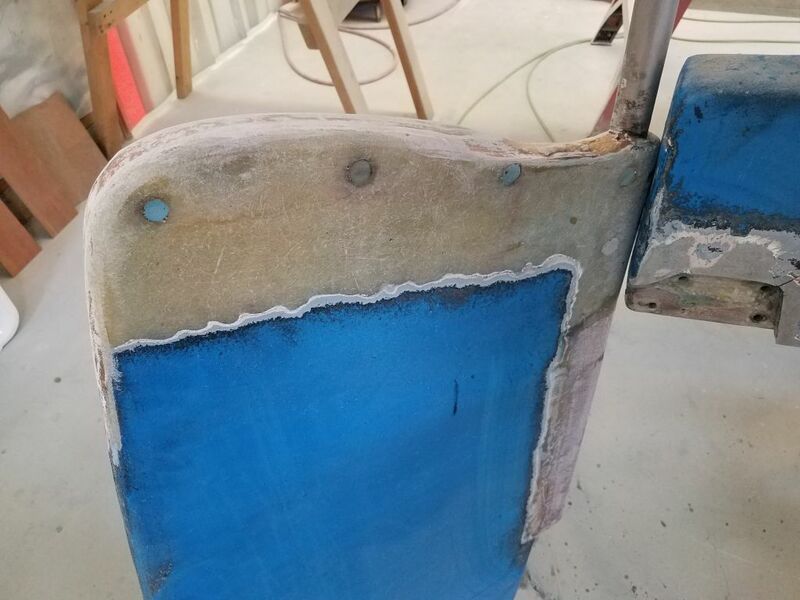 As I’d hoped, the two new layers of fiberglass brought things back to where they needed to be, without making the shape too large. 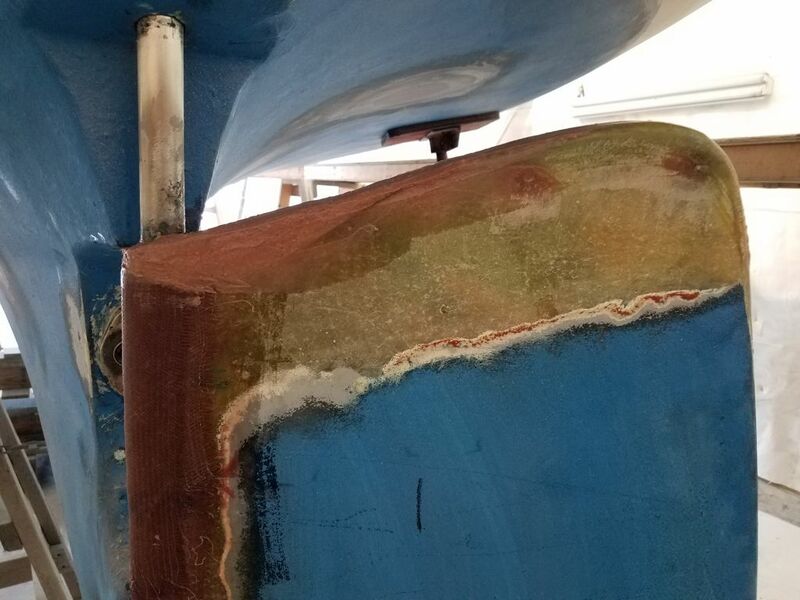 With the lower section glassed, I used my jack and blocking to raise and support the rudder at a greater height so I could access the top portion of the leading edge. 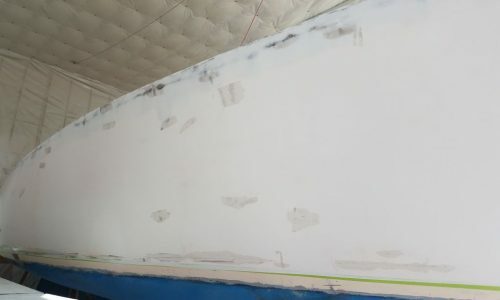 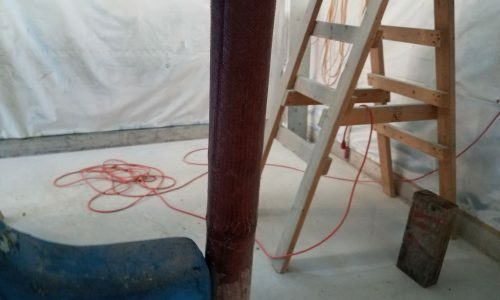 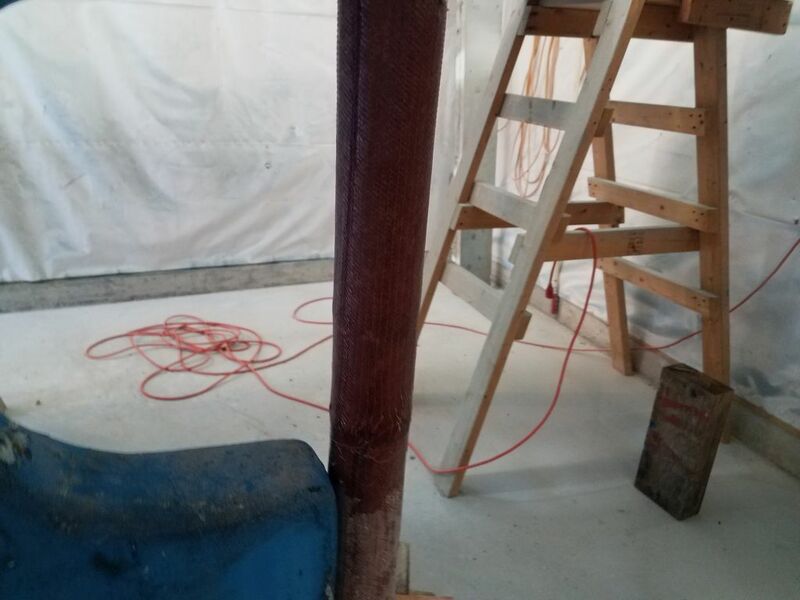 After final preparations, I installed the corresponding two layers of fiberglass over the top, with the top layer overlapping the bottom section by three inches as planned. 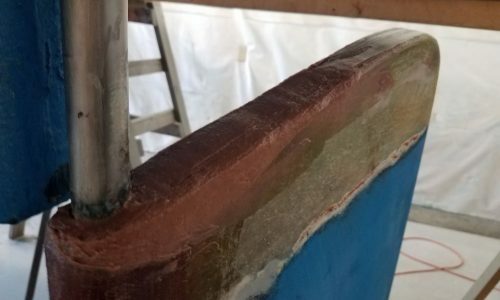 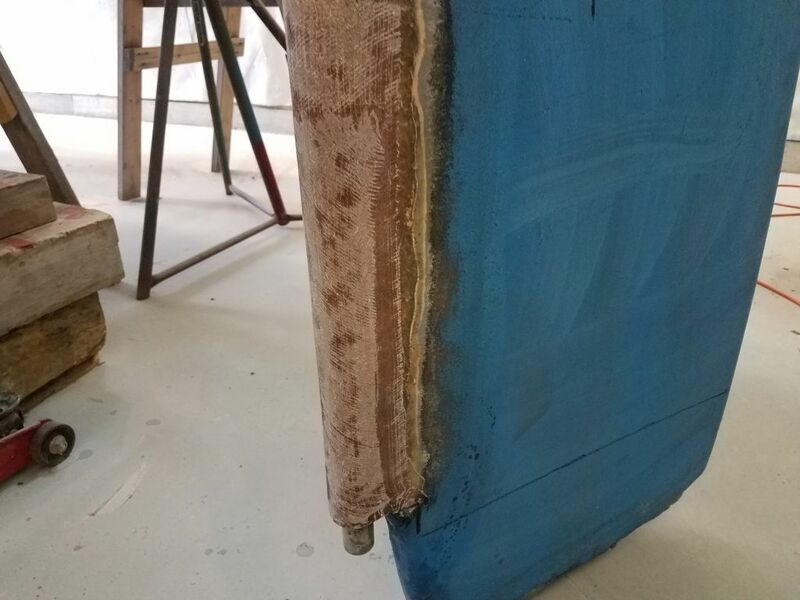 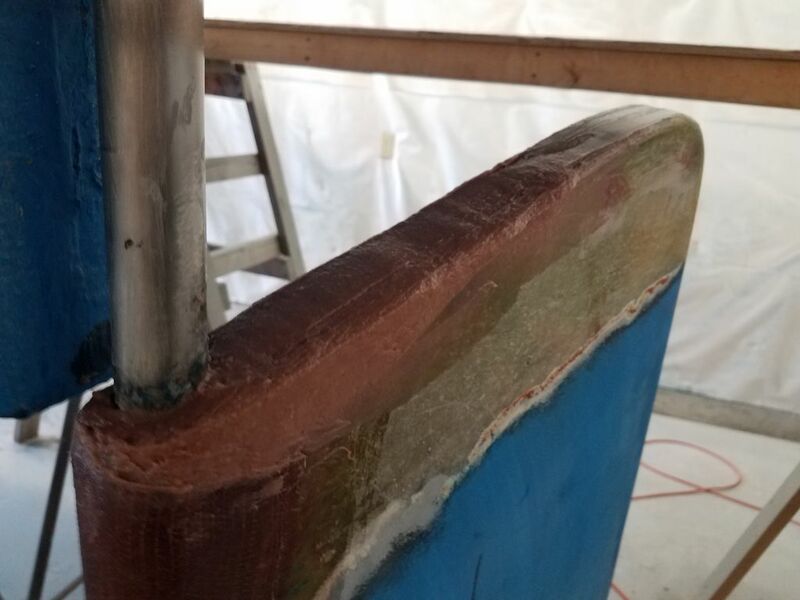 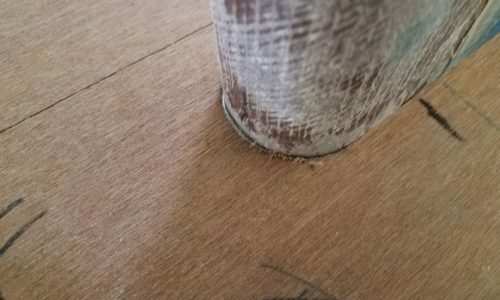 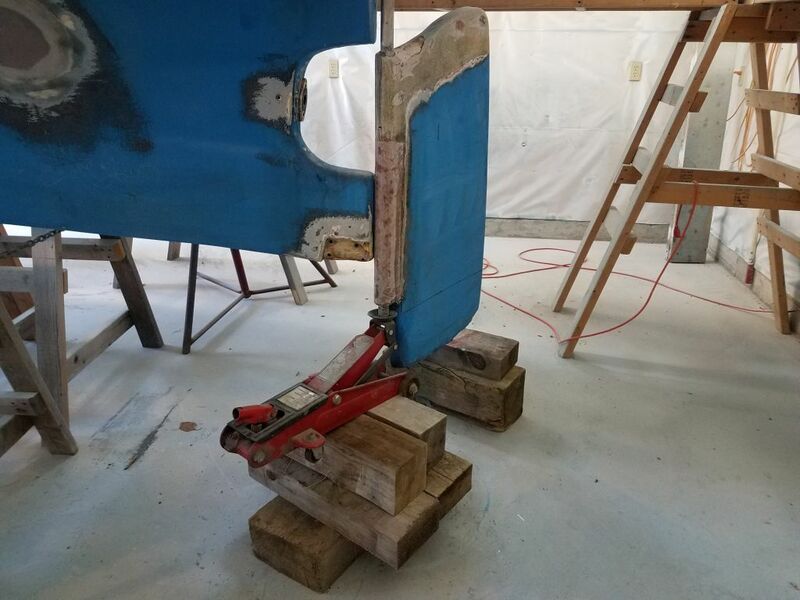 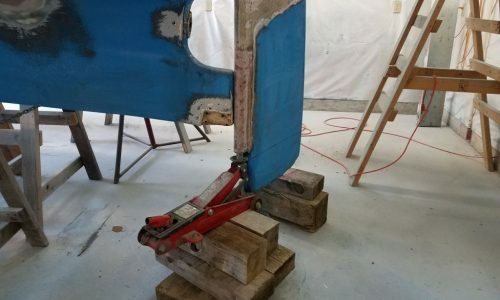 At the top of the rudder, I used a thick mixture of strengthened epoxy to build up the forward section near the rudderpost, bringing it back close to the original shape,. 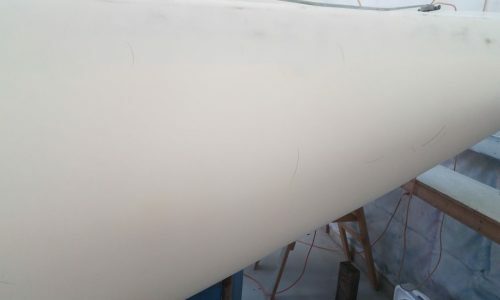 working only by eye at this stage. 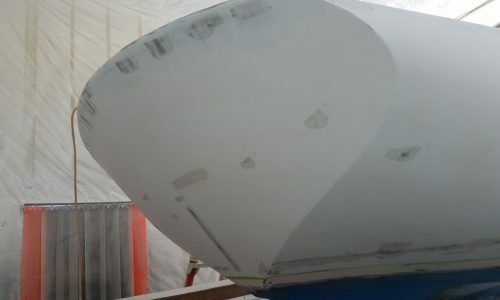 This application would later serve as the basis for the final shaping once cured. 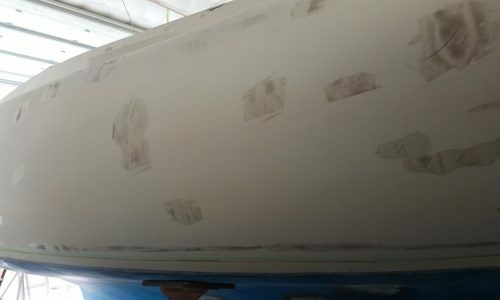 Moving on, I turned to the topsides, beginning with vacuuming and a solvent wash to remove residual dust from an earlier round of sanding following the high-build primer. 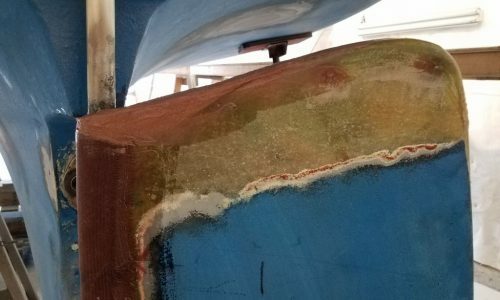 Afterwards, I went closely over the hull with a strong light, looking for small flaws and pinholes that required filling, just as I’d done on deck before. 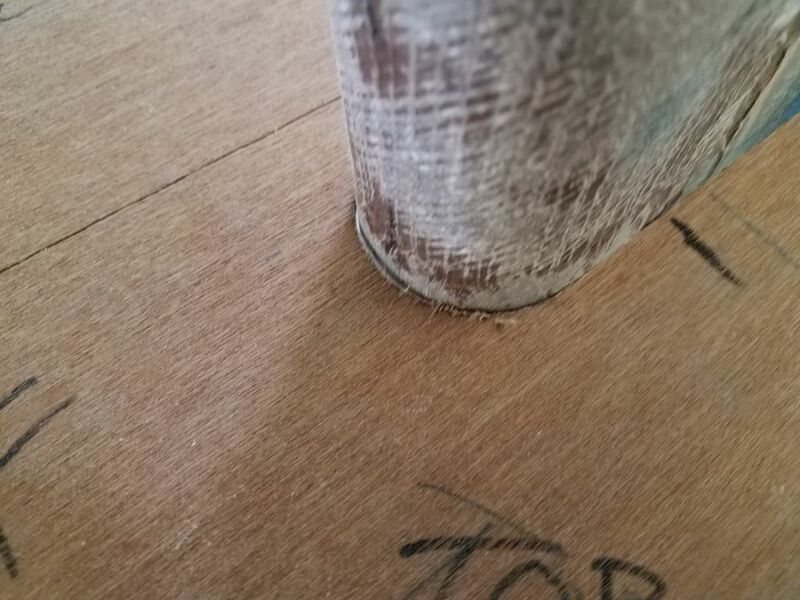 I marked these with simple pencil marks as I found them, since it was very hard to see them otherwise. 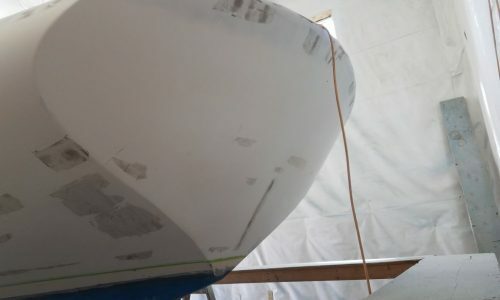 This would make filler application easier. 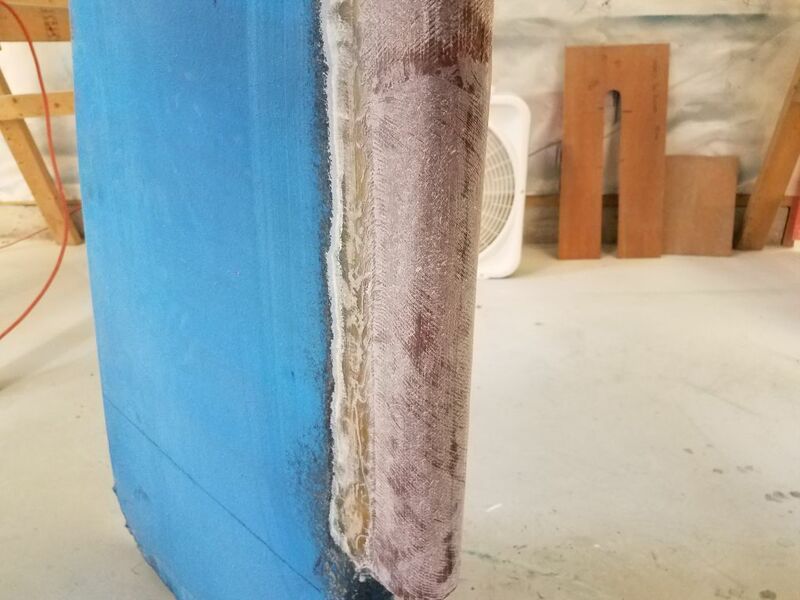 Mixing up a batch of epoxy fine filler compound, I troweled it into the various spots as needed, including filling the remnants of the recessed scribe line from the top of the original boottop.